After section 2's really muddy walk we hoped for better paths for LOOP section 3. As is becoming customary, we started our walk at Jack's in Queen's Park. Not really the walk of course, but a hearty breakfast. Interestingly the place seemed to be crawling with police officers this morning. After breakfast, we were also happy to see that the Queen's Park Panda was back again—it seemed to have gotten a wash.
After making our way by rail to Petts Wood—without weekend engineering getting in the way—we proceeded towards Jubilee Country Park for section 3. After going in the wrong direction straight from the start, we managed to find our way and were happy to see that there was not too much mud. 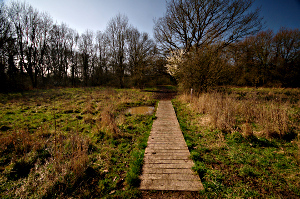 And where there was mud, some handy wooden bridges were provided. It was a gorgeously warm day, and it felt pretty much well into spring. 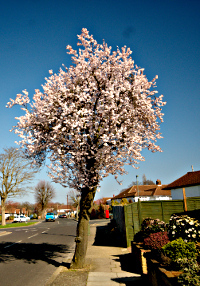 The trees were getting into blossom and the sky was blue. After going through a bit of town, the muddy paths returned once we hit woods. Not quite the bogs from section 2, but we couldn't ignore their muddyness altogether either. The route took us through Darrick Wood (with a bit more mud), and after going in the wrong direction a tiny bit (OpenStreetMap was wrong) a view opened up over Farnborough's fields. Leaving the fields behind us we continued through Farnborough until we heard the sound of a violin. The route then continued through the cemetery of St. Giles the Abbot. Besides it being a lovely church and a cemetery full of daffodils it also sported a war memorial for the first and second World War. Not long after leaving the cemetery behind us we made it to High Elms Park were we stopped for lunch at the Green Roof Cafe. Some scones and a refreshing cider gave us enough energy to continue our way. The first thing we got to admire was the Bromley Millennium Rock — apparently one of the oldest rocks of the British Isles, a mere 2 billion years old. After passing by the ruins of an old manor, and The Clock House, we climbed up a hill. At the bottom of the hill, the path showed a lot of erosion from running water. We soon turned off the narrow dirt track onto the side of a field which was very pleasant to walk on. Definitely a lot better than the path that we just left, as that had turned into a little lake as you can see below. A bit later we walked around a field where the Metropolitan Police trains their dogs, and we were often reminded not to get onto their field. The route took us up a hill through the Holwood estate with Holwood House on the top of the hill. The house was owned by William Pitt the Younger, one of Great Britain's prime ministers. 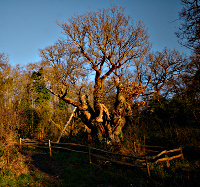 Near the top, we encountered the stump of an Oak tree, with a new tree growing in the middle of it. 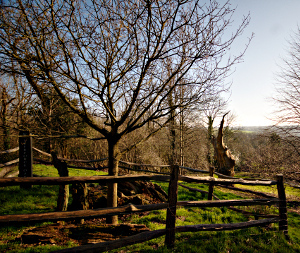 The original oak tree, the Wilberforce Oak, is quite significant in the abolition of the slave trade in the British Empire, and there is a nearby plaque quoting from William Wilberforce's diary stating: "At length, I well remember after a conversation with Mr. Pitt in the open air at the root of an old tree at Holwood, just above the steep descent into the vale of Keston, I resolved to give notice on a fit occasion in the House of Commons of my intention to bring forward the abolition of the slave-trade". 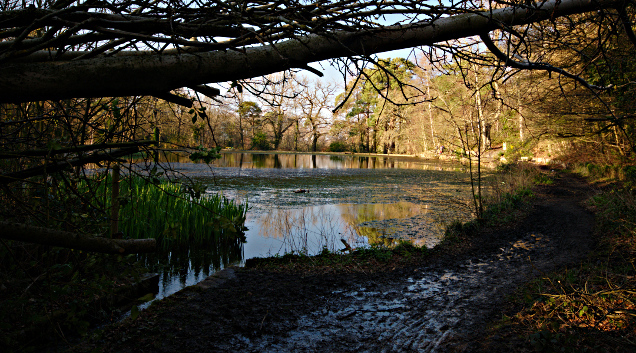 Down the hill we walked into Keston Common which has a few lovely ponds that you can fish in. Although the paths around it were a bit muddy it is an excellent spot to find some ice cream. Through some woods we came to a road, with a pub on the other side of it. After climbing up the hill, and down again, we were certainly thirsty and stopped for a pint at gastro pub The Fox Inn. It has a lovely interior and the beer garden was teeming with locals enjoying the sunshine. The walk then took us through Hayes Common, and with the Sun nearly setting all we had to do, is go up and down two steep hills to make it to Hayes station. Perhaps we should take a different route when we start with section 4! The weather was beautiful at 15-18°C and there was nothing but blue skies. We took just over four hours for the 19.7km walk.